I remember as a boy fishing on the charter boats out of Sheepshead bay, NY that a tile fishing trip meant at the least an overnight adventure. I am very lucky to now live in South Florida where I can enjoy Golden Tilefish fishing a mere 3-4 miles off of Miami Beach. Although the fishing grounds in the north east have a much greater population of these tasty denizens of the deep, you have to travel more than 100 miles offshore to the various canyons and deep water trenches to reach them. I have many friends who cry and whine like school girls just bringing up a big Amberjack from a 200’ wreck so these depths usually require the use of electric reels. With calm seas and a moderate current its possible to use a smaller reel that can handle a substantial amount of say 50lb test spectra line on a 4/0 size reel and a stout standup rod such as a Tuna stick. We found that a small Electra mate motor on this set up does the job quite nicely. Many anglers still prefer to use wire line with massive reels and electric motors that can life a small car! Remember the size of the fish you are trying to catch, as Golden Tilefish only average about 7-10lbs. Bringing back a Golden Tile of over 20lbs will surely bring plenty of onlookers and questions back at the dock, but more commonly expect fish in the 3-15lb range. There are many Fishermen who fish for Golden Tilefish with a simple deep drop “chicken rig” commonly used for snappers and deep water groupers but many Anglers have been switching over to a strip rig. Similar to what Fisherman in the North East have used for ages, a 3 way swivel with a hefty weight tied to the bottom of the swivel with a few feet of mono with the main line to the top of the swivel. From the middle of the swivel a few feet of mono with a circle or J-hook will do just fine. If you are using expensive terminal tackle and lights on this rig, remember to set it up so a snagged weight on the bottom won’t end up costing you the next car payment. Golden Tilefish prefer muddy bottoms and live in holes that they dig. It is said that a Tilefish will never occupy a hole dug by another Tilefish. Finding the right soft bottom that is in proximity to other structure or hard bottom is the key to finding fish. Of course this bottom needs to be located in the proper depth range to hold Golden Tilefish. Fresh chunks of Ballyhoo or squid work very well for Golden Tilefish as well as a number of other species that inhabit the deep dark waters over 500 feet down. Many fish that inhabit the dark waters rely on scent to a large degree so making sure the bait is fresh is extremely important for success. A moderate Northerly current is needed for this type of fishing, too slow of a current and Golden Tilefish will not feed, too quick of a current and you may need to deploy a sea anchor to slow you down or bump your vessel in and out of gear to slow down the drift. Fishing for Golden Tilefish is more than merely dropping a line deep into the ocean and drifting for a while. You must know where to look, and prepare your gear and bait properly. Having said that, there is nothing more fun than drifting a few miles off the coast of Miami, sharing fish stories with friends and waiting to come across the extremely tasty Golden Tilefish. Regulations are constantly changing so do not forget to check your catch and size limits for the Golden Tilefish, and don’t be surprised if a Swordfish, Grouper or deepwater shark may pay you a visit as well! I'm a sweet natured, inexplicably irresistable Outdoors and Waterman trying to solve the world's problems with opinions on everything! You gave a great overview of Golden Tilefish. Thanks. We have only one restaurant in Katy Texas (suburb of Houston) that serves tilefish and they only have it sporadically. It is our favorite fish. I now know a lot more about it and its habits. Cost Del Mar’s Tuna Alley, Where Fashion meets Function! 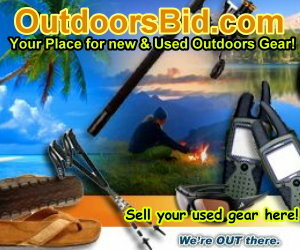 “OUTDOORSBID” for New and Used Outdoors Equipment!